Killerglass Upper Radiator Hose for Dodge Magnum 2005 2006 2007 2008 (All Models). 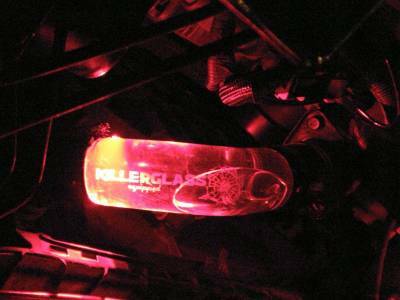 Killerglass Dodge Magnum Hose Kits are the latest trend in Radiator Hoses. Choose from Red, Blue or Green Upper Radiator Hose for Dodge Magnum SXT R/T or SRT8! 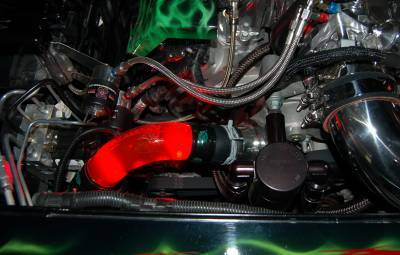 Please note the SRT8 is a slightly larger diameter hose then the base Hemi to fit the larger cooling system it is equipped with for all that horsepower. This kit fits the 5.7 & 6.1 liter, please indicate motor size below or call us for the proper fit. V6 2.7 & 3.5 are also made, simply indicate engine below. These hoses are longer then the Hemi due to the longer OEM hose we have to work with.